MommyLawyer: I Learn Things From Blogs... and I'll Prove It! We don't watch television. Yes, I watch, via the internet, 3 shows - Lost, the Office, and Grey's Anatomy (please don't think less of me) - and we share family movie night on Fridays. However, we have no cable or satellite. As for news, I get that online as well. So imagine my surprise, as I was perusing other homeschooling blogs, to learn that time changes to Daylight Saving Time at 2:00 a.m. tomorrow morning! Good thing I found out - we would have been an hour late to Mass in the morning (as opposed to 5 minutes late as is our norm). just had to say hi - your blog popped up while I was googling. 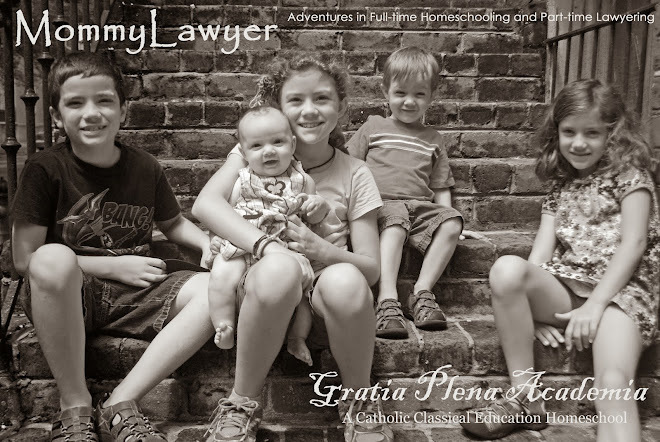 I'm also a homeschooling mom and I work part time as a guardian ad litem. Yep, we missed it too....had reminders but still forgot!